Last week, two Franklin County teams earned medals in their respective Mid Penn Conference tournaments, but this week is what we've all been waiting for — when nine area teams start their journey in the district playoffs. We also have teams competing in states, a conference championship and more, so don't miss any of this week's Franklin-Fulton five games to watch. Monday, Mason-Dixon Christian Conference girls soccer championship, 7: The Shalom Christian girls soccer team will take on Shenandoah Valley Christian Academy in the MDCC championship game on its own turf. The 15-1 Flames' only loss of the season came to Shenandoah in a narrow 5-4 loss in the first game of the season, but Shalom holds the most recent victory in the series with a 3-2 overtime win. Shalom earned a spot in the championship game after an 8-0 shutout over Heritage. 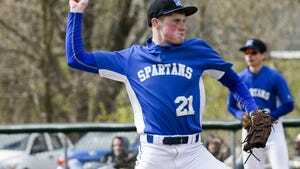 Tuesday, PAISAA baseball tournament: The Mercersburg Academy baseball team moves on to the PAISAA state tournament after winning its sixth straight Mid-Atlantic Prep League title last week with a decisive doubleheader sweep over Lawrenceville. The Blue Storm will host Westtown in the first round of the state tournament Tuesday. Mercersburg enters the tournament as the No. 5 seed with a 22-4 record. The team is also on an impressive nine-game winning streak, and has won 18 of its last 20 games. Westtown is the No. 12 seed. 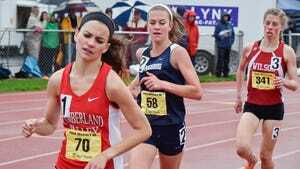 Friday/Saturday, PIAA track & field championships: Seven area Class AAA athletes will compete in the PIAA track & field championships at Shippensburg University. From Chambersburg, Abby Yourkavitch and Kaylee Mowery will compete in girls distance competitions. Both qualified for the 3200-meter race, and Yourkavitch also qualified for the 1600. Kelton Chastulik, also of Chambersburg, will compete in the boys discus. Greencastle will have four representatives at states, with Lauren Hirneisen joining Yourkavitch in the 1600, while Jenay Faulkner will compete in the girls shot put. Campbell Parker qualified in the boys shot put and discus, and Liam Okal will battle in the boys 200. In Class AA girls, McConnellsburg's McKenzie Gelvin qualified in the 400 (No. 2 seed) and 800 (No. 7), Southern Fulton's Celina Merchant (300 hurdles) and Sarah Wright (javelin) advanced and Fannett-Metal's Lizzie Peppernick (discus) will also compete. For the AA boys, SF's Chase Varner (800) and McConnellsburg's Josh Booth (300 hurdles) have qualified. Districts 3 and 5 baseball tournaments: Franklin County has two representatives in the District 3 baseball tournament, Greencastle-Antrim in the AAA tourney, and Waynesboro in AAAA. Fulton County has three teams heading to the District 5 Class A tournament - reigning district champion Southern Fulton will be joined by Forbes Road and McConnellsburg in the postseason. Eastern York at Greencastle-Antrim, 4:30: The Blue Devils hold the top seed in Class AAA bracket, boasting a 17-1 record heading into the tournament. They will take on No. 16 seed Eastern York in the first round Monday with home field advantage. Greencastle comes into the first round after having almost a full week's rest since its last live action in the Mid Penn Conference tournament last Tuesday. The Blue Devils won the championship by beating Mifflin County and West Perry. The Knights (13-7) enter the District 3 tournament out of York-Adams Division III. Waynesboro at Cumberland Valley, 4:30: Waynesboro (14-6) enters the Class AAAA tournament as the No. 10 seed, and takes on No. 7 Cumberland Valley (13-6), the second-place team out of the Mid Penn Commonwealth. The Indians have stayed relatively consistent throughout the season, winning 11 of their last 14 games, and based on district rankings, Monday's showdown could prove to be a competitive matchup. Neither team made it to their respective conference tournaments, and have not played in a game for at least a week. McConnellsburg at Forbes Road, 4:30: McConnellsburg's turnaround season continues Wednesday when it travels to Forbes Road to take on a familiar Sideling Hill League/Inter-County Conference opponent in the first round of the District 5 Class A playoffs. The Spartans were swept by Forbes Road in the regular season, but the second loss proved to be a wakeup call for McConnellsburg, which went on to win its next eight games to reach the district playoffs. Forbes Road has been a relatively inconsistent team, with coach Randy Gelvin stating that sometimes the team "beats itself before they even get off the bus." The Cardinals (11-7) hold the No. 4 seed with an 11-7 record, while McConnellsburg (10-10) claimed the No. 5 seed after getting to .500. Rockwood at Southern Fulton, 4:30: The reigning District 5 champion claimed the second seed in the district to take on No. 7 Rockwood. The Indians (15-4) were upset in the final game of the season with a 7-2 decision against Tussey Mountain after the teams continued a rain delayed game from April. Rockwood completed the season 8-8. District 3 softball tournament: Franklin County will send four teams to the district tournament, with Chambersburg and Waynesboro competing in the AAAA bracket, and Greencaslte and James Buchanan in the AAA tournament. Muhlenberg at Chambersburg, 4:30: Despite going 3-3 in their last six games, the Lady Trojans earned the top seed in districts and will take on No. 16 Muhlenberg, a team they beat previously this year 16-0 in the Big Spring tournament. But after losing in the championship game of the Mid Penn Conference tournament, Chambersburg can't take this first round game lightly. Muhlenberg enters with a 14-8 mark after losing in the championship game of the Berks League tournament. Waynesboro at Penn Manor, 4:30: Waynesboro, the No. 14 seed, takes on Penn Manor, ranked third, for a challenging first round matchup. The Comets (19-3) were the runners-up in the Lancaster-Lebanon League playoffs after an extra-inning battle against Hempfield, while the Maidens will have not played a game in over a week. Waynesboro's appearance in the district tournament is an accomplishment in itself, after the Maidens (13-6) almost flipped their 5-15 record from 2015. Waynesboro has won seven of its last 10 games. Big Spring at Greencastle, 4:30: The Blue Devils take on a familiar opponent in the first round as they welcome Mid Penn Colonial foe Big Spring. This season, Greencastle (15-5), the second seed, split its series with the Bulldogs (11-9), ranked 15th in the Class AAA bracket, 1-1, falling in a rough 20-5 loss in the teams' first meeting of the season. But G-A coach Mark DeCarli said that game was a turning point for the Blue Devils, who came back to win 11 of their last 13 games on the way to a Colonial title. Greencastle lost to Lower Dauphin, the eventual Mid Penn Conference champions, in the semifinal round of the MPC tournament. Big Spring placed fourth in the Colonial Division. James Buchanan at Lampeter-Strasburg, 4:30: James Buchanan snuck into the Class AAA tournament as the No. 16 seed to take on the top-ranked team in the division, Lampeter-Strasburg, which holds a 20-1 record heading into the tournament. The first round will prove to be a challenge for the Rockets (10-8), who have struggled to close out the season strong, going 3-4 in their final seven games of the season. But JB did defeat No. 8 Littlestown 4-0 and fell only 1-0 to No. 3 West Perry in the final week.